Hello, 2018, you’ve made it. And it’s a very good thing that I did not leave my appetite in 2017. I brought it with me. I must admit that spending a few weeks in Morocco towards the latter part of 2017 left me with a bit of depression. Imagine going to country with so much beauty, culinary delights, and warm weather, only to return to Chicago experiencing an early freeze and a refrigerator that I had emptied before my vacation. Thankful, I had a memo for Kingsbury Street Cafe at 1523 N. Kingsbury Street. 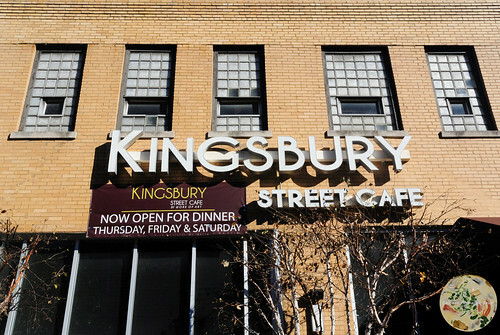 My first visit to Kingsbury Street Cafe was a few days after my return to Chicago. Temperatures were not all that bad, so I didn’t complain. When I arrived at the restaurant, there wasn’t the usual long line outside or any kind of wait inside like what you experience at lot of breakfast spots in the city. Spacious and full of light, I was in for what I expected would be a pleasant experience. 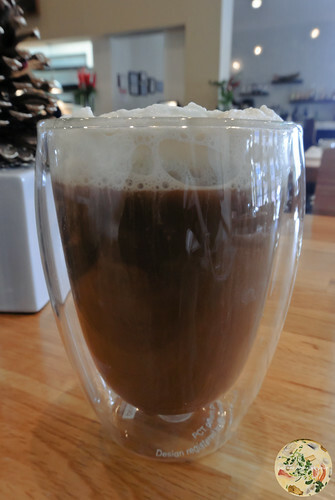 I started with a millionaire coffee, which was a nice winter recipe of house coffee, rumchata, kahlua, and frangelico topped with whipped cream. I call this my festive beverage. First to the table was a cup of egg and carrot soup. This reminded me a bit of Chinese egg drop soup in texture, but of a rather light autumn soup thanks to the presence of carrots. 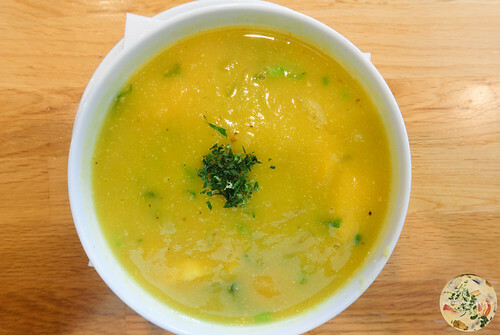 If it is still on the menu, I highly recommend having it, especially during the chilly months. 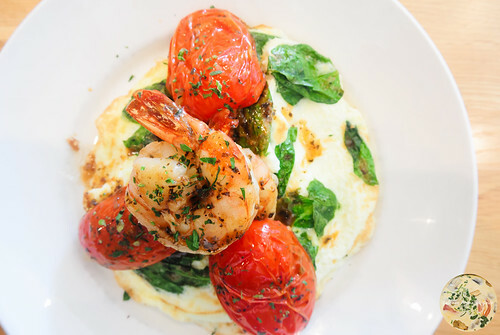 The finale was a plate of shrimp and spinach frittata with stewed tomatoes. The shrimp were plump and nothing close to popcorn size. It was also evident that they were fresh from the absence of a fishy aftertaste. Tomatoes are a vice for me, so I was well past satisfied while devouring the ones in the dish. Everything in the dish worked well and I must say that this was a nice deviation from the usual pancake, waffle, and omelette offerings. During my second visit, which was at the beginning of the New Year, I went a little later in the morning and it was full of quite a few patrons. Granted it was the weekend instead of in the middle of the week like I had gone the first time, there still was no wait. I was fortunate to have the server who was my server during the first visit. 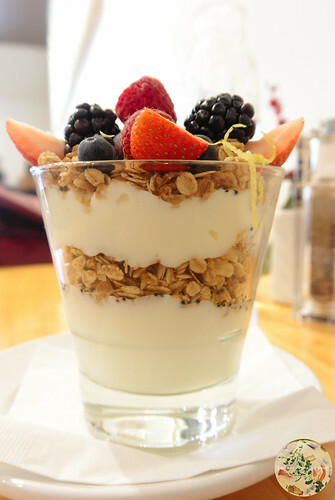 After a few pleasantries about the Christmas holiday, I had a mimosa and a parfait of yogurt, granola, raspberries, blackberries, blueberries, and strawberries. Simply divine as a healthy starter. 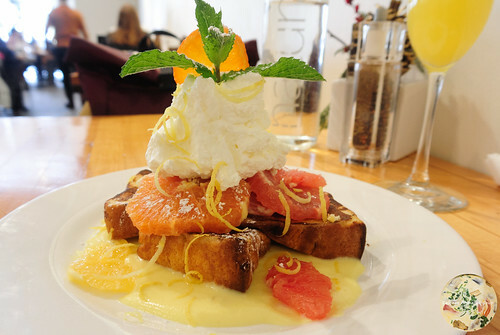 The finish was a plate of angel food cake French toast with orange slices and lemon zest topped with whipped cream. 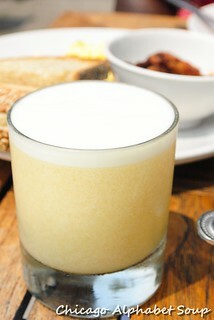 Sitting atop a crème anglaise, this weekend French toast was a winner. 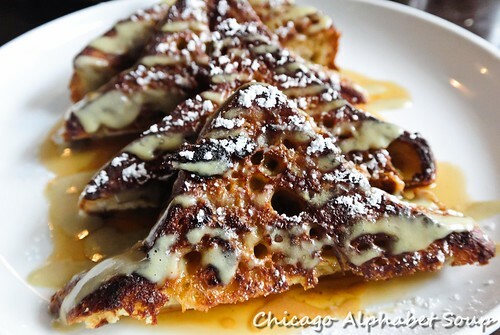 The concept in French toast preparation was different that what I’ve had before, that being light and fluffy like angel food cake, so that made it the more appetizing. 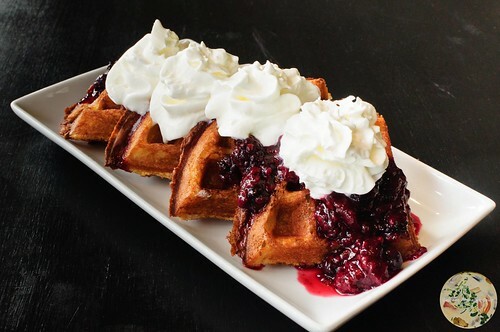 Without any syrup, this can be enjoyed to completion without recognizing that no additional sweetener was needed. Kingsbury Street Cafe scores high points with the great service. It’s clear that the output from the kitchen is consistently good. 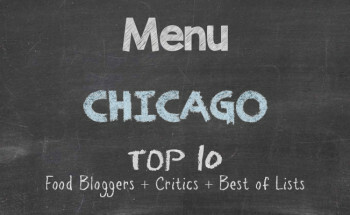 The amount of navigation space and elbow room is also a high mark, especially when so many restaurants in Chicago entertain crowding diners into the dining area. 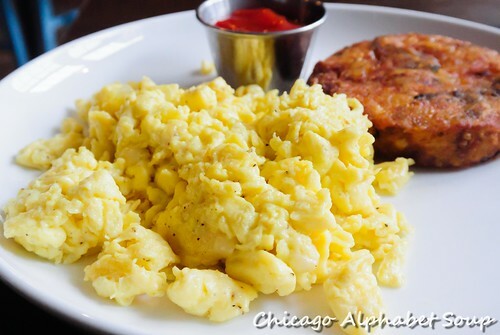 It may be that Kingsbury Street Cafe is not on a “Best Brunch Spot in Chicago” list, which explains why seating is fast. 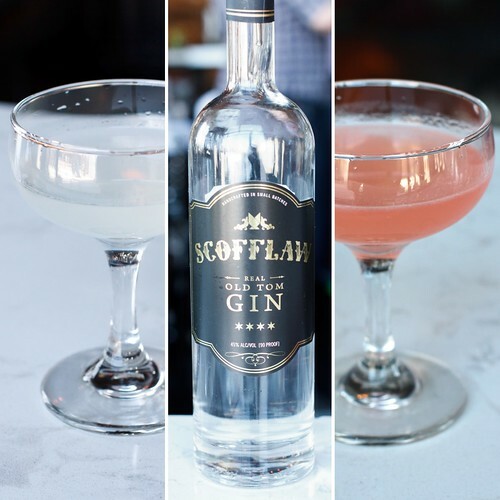 Nevertheless, if you are seeking a breakfast or brunch — or dinner on Thursday, Friday, and Saturday — spot where you don’t find yourself wondering if you’ll ever get a seat, add Kingsbury Street Cafe to your destination. While going for nigiri at a Japanese restaurant in Oak Park with my restaurant advisor, we walked by a nearby coffeehouse. The name, Addis Cafe, was rather captivating to us, as we wondered if it was a cafe that served Ethiopian options for the palate. 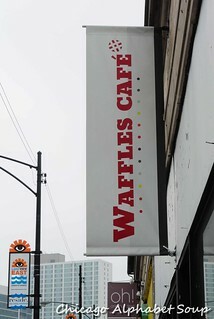 After a quick Google search, since the cafe was closed, we saw that they indeed served coffee but they also served breakfast options along the lines of waffles and scones. 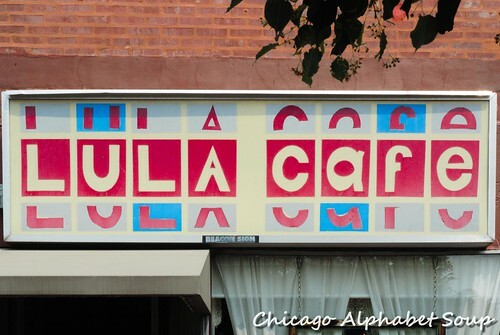 So, during the weekend, I returned to Addis Cafe at 818 S. Oak Park Avenue in Oak Park, IL, while my restaurant advisor had homeowner tasks to tend to. Let me just say that I love the limited menu concept. It’s very reminiscent of cafes throughout Europe, South America, and sections of Australia where what’s served has been perfected because there isn’t a focus on trying to cover a plethora of menu items. 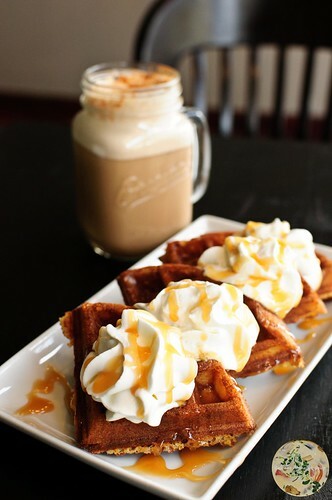 I started with a spicy chai and a plate of salted caramel waffles. When I requested that the chai be spicy, I got it exactly how I wanted it. 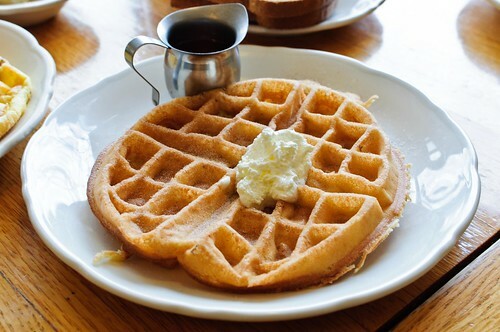 And having had waffles from all over the world, the waffles at Addis Cafe rank on my Top 5 Waffles Worldwide List. It’s one thing to mention that they’re crispy on the outside and chewy on the inside. It’s another to mention that they actually pop with flavour and require no syrup. For the second round, I considered a cup of coffee, but I had another spicy chai and a plate of mixed berry compote waffles to go with it. Unlike most compote, the version at Addis Cafe did not have the berries drowned in syrup. It was almost as if the berries had been macerated so that they were in their natural juices. This made it that much better because I could taste the berries without a saccharine heaviness on my tongue. With no more room for eating more, I shall return at a later date for a sampling of their savoury waffle topped with gorgonzola and sun-dried tomatoes. 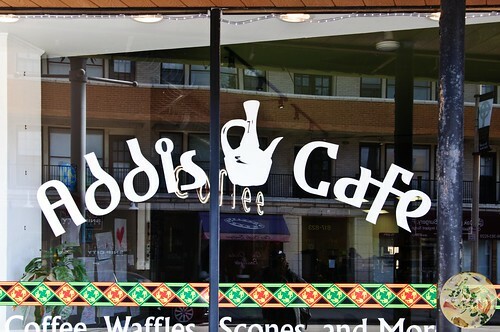 Addis Cafe is a quaint coffeehouse with extremely reasonable prices and outstanding service. 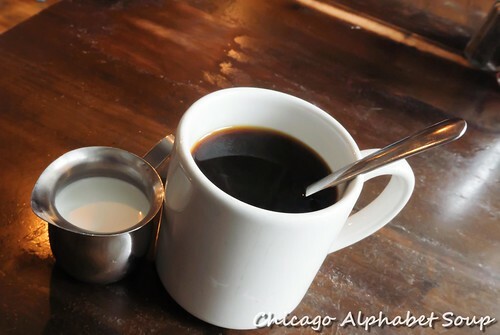 I’m slowly working coffee back out of my diet, so I didn’t have any for making an observation of quality and taste. The chai was addictive enough. I will also have to save room for one or two scones. Oak Park is very family oriented so there were several parties that came in with little kids, the parents letting the kids have a good run of the place. 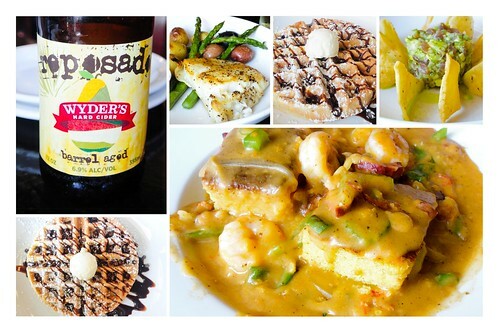 There are no meat options on the menu, but everything is so blooming good that you won’t miss meat. Addis Cafe proves that the most inconspicuous places are absolute top. When I think of diners, what comes to mind are burgers, fries, and milk shakes. And then you go to a neighbourhood like Ravenswood and find that the local diner is a seafood restaurant. You smile. Well, I smiled. Let me start by saying that I had an aggressive appetite. CrossFit and kickboxing early in the morning had already worn me out, but in a good way. However, such intense workouts crank my appetite and I obey. Glenn’s Diner at 1820 W. Montrose Avenue certainly fits the bill for satisfying one’s craving. Starting with brunch, I loved the chocolate chip waffle drizzled with chocolate syrup. 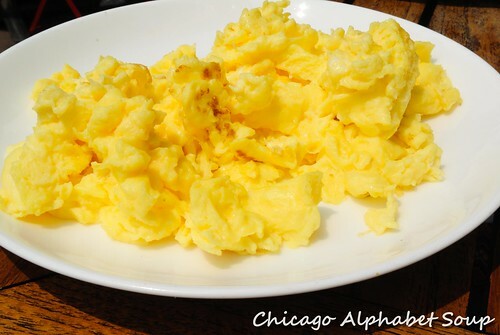 Loved the scramble eggs with cheddar cheese. 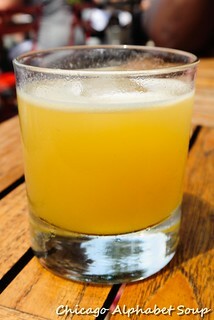 When brunch was done, I waited about 20 minutes, got my second wind, and then had the tuna tartar with chips. Raw tuna compacted together with avocado and onions. Delicious. And then I had halibut with potatoes and asparagus. Talk about flaky fish and everything being seasoned without being overdone. 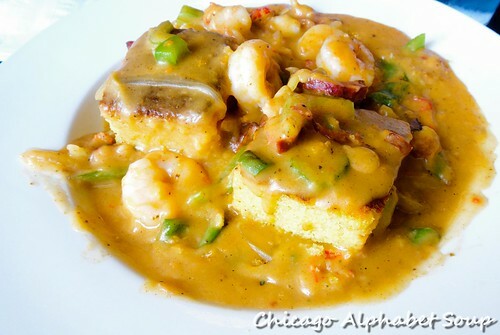 The jambalaya with cornbread was out of this world, although it didn’t come with rice. It was closer to the jambalaya that I’ve had in New Orleans than the attempts I’ve had at other New Orleans style restaurants in Chicago. There is a constant flow of patrons coming and going at Glenn’s Diner. During midday the crowd was light. Given the breakfast was good, I imagine the morning crowd fills the restaurant. The food is certain worthy, so I can understand if the restaurant stays crowded. I’ll be a part of the constant crowd from now on, for true. So glad they were not about burgers, fries, and milk shakes. 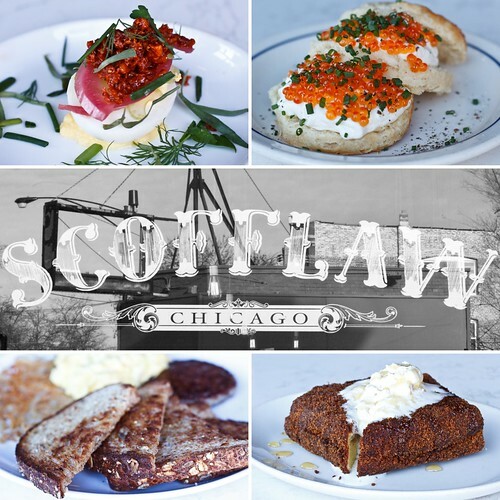 Going for breakfast on Saturday and Sunday mornings in Chicago can be rather discouraging. Many breakfast spots have long lines outside and crowded waiting areas inside. If you are like me and you are not a fan of waiting a long time for something to eat, you end up preparing your own breakfast at home. And then you stumble upon Bite Cafe. It could be that I arrived as soon as they opened for business because the restaurant did start to fill up later, but not such that patrons had to wait outside for a seat. This was a huge plus. Quite cozy on the inside, Bite Cafe does not fit the big box or even medium size restaurants. Not of the hole-in-the-wall variety, but definitely inviting, my appetite and I were rather happy. 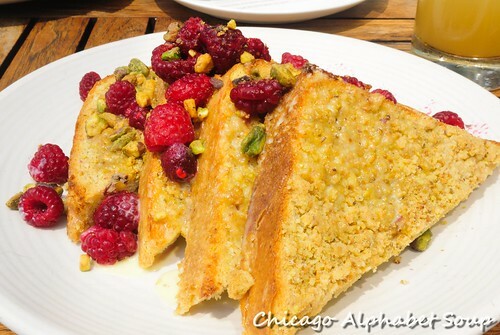 I ordered mashedbrown, eggs scrambled well with Gruyère cheese, and the challah bread French toast. The mashedbrown was a potato cake that I’d buy in bulk and eat in the mornings for a breakfast snack. And since I was able to get Gruyère cheese in my eggs rather than American, jack, or cheddar cheese, I was in love. The French toast was so blooming good that it didn’t require any more syrup than the maple syrup drizzle that came on it. The hazelnut butter and banana creme anglaise gave flavour without making the toast excessively sweet. So, it seems that Bite Cafe also has lunch and dinner menus. I shall have to return after work one of the days to check out those offerings. The breakfast set was definitely good enough for me to consider several more mornings visits. As of late, things have been quite scrambling. What is one to do when you’re dealing with work, CrossFit training, trying to squeeze in a few television shows, and catching up on reading? I can’t speak for most, but I get an appetite, after which I experience that sleepy feeling when I’m done gnashing away on too much food. 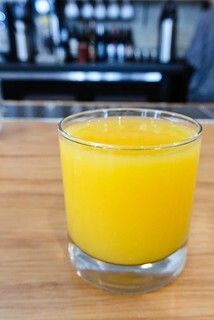 Nevertheless, I have resigned myself to not skip out on breakfast or brunch. For my latest morning hankering, I ventured to the Ukrainian Village to The Winchester at 1001 N. Winchester Avenue. What looks like a giant beige block is a rather nice contemporary restaurant in one of Chicago’s hip neighbourhoods. Upon entering the spacious area, there is the hipster contingent and a mix of hipster parents. 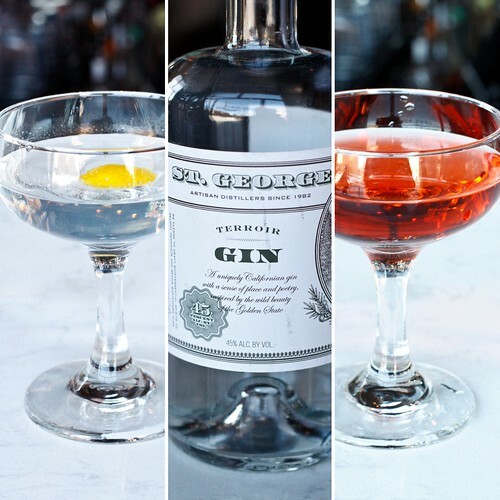 Still, there isn’t the distant demeanor that tends to be prevalent at hipster spots where the service is outstanding if you fit the hipster mold. Actually, the staff at The Winchester is quite engaging, which is a nice change from feeling as if you’re an inconvenience. 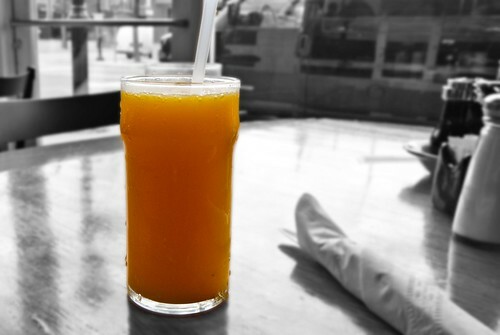 I started with fresh squeezed orange juice to whet the palate while scanning the menu. 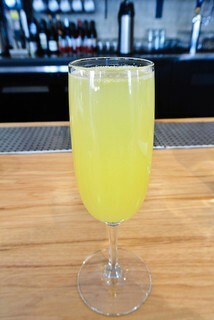 It was brunch, so I figured I would have my “when in Rome” moment and partake of an alcoholic beverage — a mimosa. 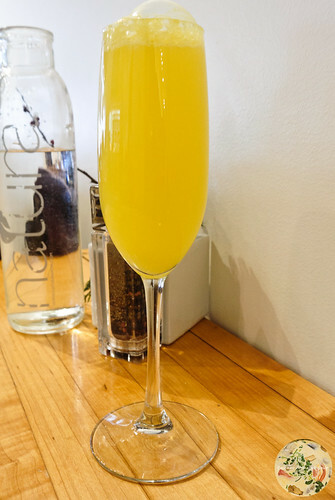 Yep, champagne and orange juice in the morning is not a bad option, especially when you couple it with waffles topped with toasted rice, apples, and a dollop of whipped cream. 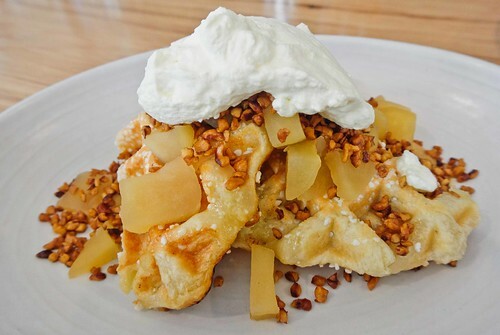 Given the waffle was not saccharine, the natural sugar from the chopped apples provided enough sweetness such that no syrup was required. 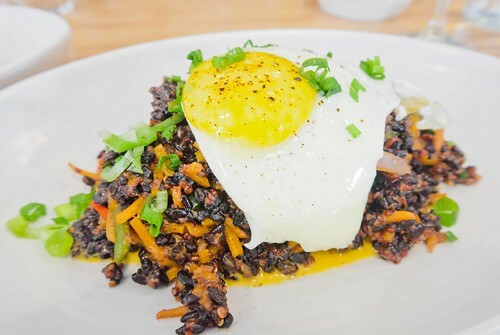 As if the large plate of waffles was not enough, I ordered a plate of fried black rice with Thai green curry and topped with a fried egg. The football player sized guy sitting next to me looked at me with what I could only describe as mild shock. I know I am not quite the size of a linebacker, but CrossFit really keeps my hunger on full tilt. It became clear to him and his two fashion model girlfriends that I was not playing around. This is not fried rice you will find at a Thai restaurant, but it is definitely fried rice that Thai restaurants may want to add to their menus. Although not on a main road, The Winchester is not far off from West Division Street or West Chicago Avenue. Those who rank restaurants according to ambiance will love the well-lit interior as well as the spaciousness. The diners who entered received a lot of attention from the wait staff, which is a plus. 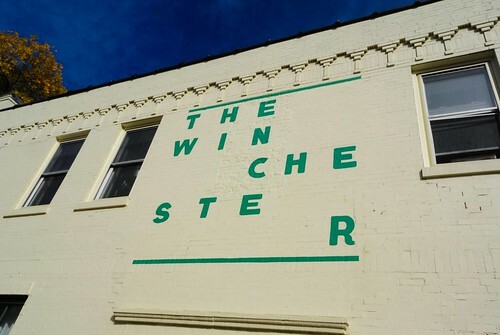 Where The Winchester shines is with the food. I can say with certainty that the breakfast offerings are top. One of these evenings I shall have to return to sample something from their dinner menu. Based on brunch, The Winchester draws a crowd. I can only imagine how the restaurant packs out after 5:00 PM. 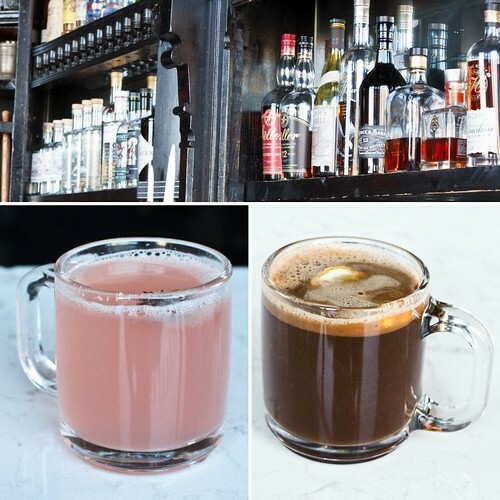 There may be popular variations of Winchester, but The Winchester in Chicago’s Ukrainian Village is the one that I have fallen in culinary love with. Imagine a Saturday morning in April with birds chirping, blue skies, a gentle breeze, and temperatures hovering in the 70’s. It sounds almost like a scene you would project during meditation. For those of us in Chicago, we view it more as a tease because we are almost certain that the temperatures will drop by 11:00 AM and it will start to feel again like the beginning of winter or the last vestiges of winter. Of course, we cannot be bothered with Mother Nature tempting us with pleasant weather this early in the spring, so we continue with things like running errands, jogging, staying in bed late, and even avoiding chores around the house. And then there are those of us who rush to some breakfast spot. It goes without saying that eating is priority in my life and starting off with a divine breakfast is top priority — when I can actually get out of bed on Saturday mornings with any kind of inertia. 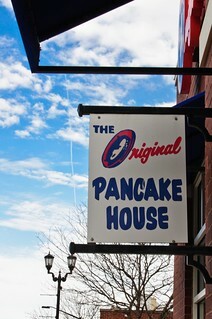 It was off to Original Pancake House at 7255 W. Madison Street in Forest Park. Having passed the restaurant several times, I knew how quickly it packed with patrons. So, it was necessary to arrive as soon as the doors opened because with the weather being so nice, I knew that people would be there like it was Black Friday. Wouldn’t you believe that I got there before the rush? Menu in hand and appetite alarm driving me insane, I ordered orange juice, a mushroom and cheddar omelette, and a Belgian waffle. Oh happy day! The omelette was not some concoction from the kitchen, much like what I have had at countless breakfast restaurants made from fringe eggs. Granted it was not all cute and rectangular. That didn’t matter. It filled my plate before I started gobbling it and filling my belly. 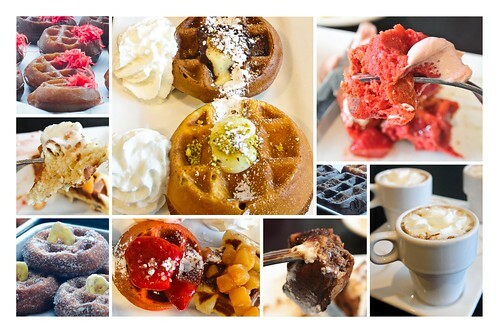 Then there was the Belgian waffle. Once you have a waffle from Original Pancake House, you will boycott Eggo. “Leggo me Eggo.” Please, you can have it because I’m going back to Original Pancake House. Now, one may think that the breakfast here may be much like what you get anywhere. No, no, no. 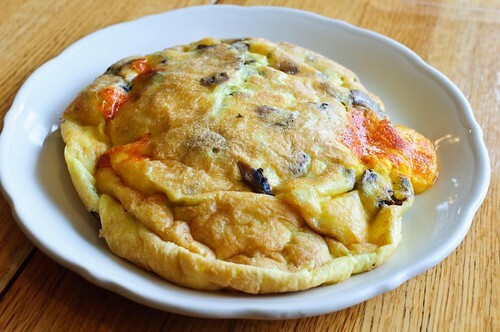 The eggs and omelette are fluffy. The pancakes and waffles aren’t weighty, but are instead light and airy. I was happy when I finished dabbing at the corners of my mouth. I cannot really say if international traveling makes me suffer from jet lag more or if it does wicked things to heighten my appetite. Having returned from a long trip, where I stood up for a friend in his wedding, I have been waffling between napping, unfolding, and hunting for something to fill my jaws. Honestly, that’s routine for me every weekend, but globetrotting really spikes my want for putting my feet under the table and making magic — making food disappear. Now, I am not a fan of denying myself a proper breakfast. And my friend’s uncle and aunt, who was hosting a group of us, cooked a Dominican breakfast that left me a tad bit rumpled with a constant smile. 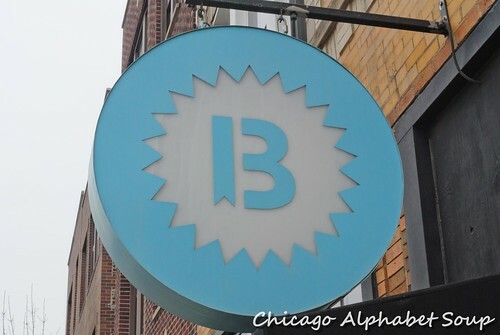 Their desayuno was exactly the hint I needed to find myself venturing towards the southern end of Logan Square to Punta Cana Restaurant at 2200 N. Kimball Avenue. 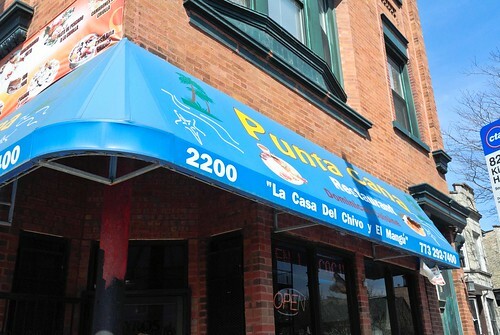 Small, quaint, family style, and with the kitchen viewing distance from the seating area even for those with nearsighted vision, I was at one of the tables having a Dominican staple of mangu, eggs, and fried cheese. Sprung!!! 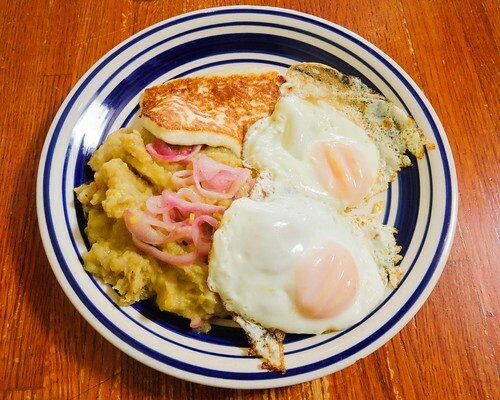 When your hunger actually has a voice, trust me when I say that a plate of mashed plantains, eggs sunny side up, and fried cheese will satisfy your craving. And with a cafe con leche in hand — Starbucks what? Intelligentia where? Dunkin Donuts huh? — I was very much in my happy place. A few days had passed and I returned. I was curious as to whether they had a certain staple in the Dominican diet that Dominicans enjoy during the weekends. I wanted some sancocho. Wouldn’t you know that as soon as I got through the door, there were others sitting at the few tables with their faces hovering over bowls of the soup? I must have been a bit too overjoyed because a few seconds had passed before I registered that the woman at cash register had asked me where I was from because my Spanish was so fluent. If I don’t know anything else in any other language, I have a comfort ordering food. 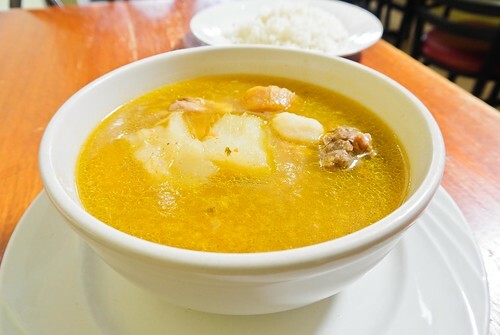 And believe me when I say that you, too, will speak Spanish complete with accent and inflections once you start slurping some sancocho. ¡Aye, Dios mios! When I made the first pass over the alphabets for the blog, finding a country representative of D was challenging. There was one Dominican restaurant that I did stumble upon. With these recent visits to Punta Cana Restaurant, I have a feeling there may be more. I shall have to hunt for them because it may be some time before I get back to Dominican Republic. In the meantime, it costs me far less to walk or bike to Punta Cana Restaurant for some more mangu and sancocho. Gino, your plate of food is in la concina.